Many of the most urgent, important, and complex problems facing society today require large numbers of scientists possessing diverse expertise, representing different embedding organizations (e.g., universities, corporations, government entities, nations), and distributed in time and space to join forces integrating across multiple types of boundaries. Although universities and research organizations largely organize effort along singular boundaries: singular discipline, nation, location, and temporal positioning, wicked problems of knowledge creation more often than not ignore these organizational simplicities and require synergies only possible through collaborative scientific teamwork. Thus, scientific teams need to successfully collaborate as part of complex, multi-boundary collectives. 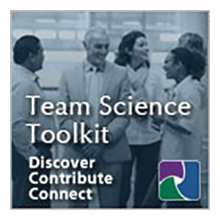 This panel will present an integrated multi-team system (MTS) perspective on science teams, beginning with an illumination of the nature of the unique issues that arise when teams collaborate as part of large systems of teams. Next the panel will explore the motivational dynamics that arise over time in MTS environments. Presenters will then consider the shared and vertical leadership of scientific MTSs. Lastly, the panel will conclude with some empirical evidence that bears on the nature of these motivational and leadership issues as they operate in multi-team environments. Leslie DeChurch, Ph.D., is Assistant Professor at the University of Central Florida, Industrial/Organizational Psychology. Her research program explores what makes effective team leaders, how teams successfully collaborate across boundaries, and how leadership and team dynamics are sustained in virtual organizations. Professor DeChurch’s research has appeared in top journals including the Journal of Applied Psychology, Journal of Management, Leadership Quarterly, Journal of Applied Social Psychology, Group Dynamics: Theory, Research, & Practice, Small Group Research, Educational and Psychological Measurement, and the International Journal of Conflict Management, and she serves on the editorial boards of the Journal of Applied Psychology and the Journal of Business and Psychology. Her research has been funded by the National Science Foundation and the Army Research on the Social and Behavioral Sciences. Her first co-edited book (with Steve Zaccaro and Michelle Marks): Multiteam systems: An organizational form for dynamic and complex environments is due out Spring 2011. Ruth Kanfer, Ph.D., is a Professor of Industrial/Organizational Psychology at the Georgia Institute of Technology. She received her Ph.D. from Arizona State University, completed a postdoctoral fellowship at the University of Illinois, and served on the faculty at the University of Minnesota prior to moving to Georgia Tech in 1998. Dr. Kanfer’s research focuses on the influence of personality, motivation, self-regulation and emotion on behavior and performance in individual and team work settings. She has published over 95 papers and chapters on these topics in organizational, clinical, social, personality, and educational outlets, and is co-editor of three books: Abilities, Motivation, and Methodology, Emotions in the Workplace, and Work Motivation: Past, Present, and Future. She is/has served on the editorial boards of seven scientific journals, the Academy of Management’s (AoM) Board of Governors, as Chair of the AoM Organizational Behavior Division, and currently serves on the Jacobs University Center on Lifelong Learning and Institutional Development Scientific Advisory Board. She is a Charter Fellow of the Association of Psychological Sciences (APS), and a Fellow of the American Psychological Association (APA) and the Society for Industrial and Organizational Psychology (SIOP). Dr. Kanfer has received several awards for her work, including SIOP’s William R. Owens Scholarly Achievement Award in 2006 and SIOP’s Distinguished Scientific Contributions Award in 2007. She has presented her work internationally, and is involved in collaborative research with colleagues in Europe and Asia. Her research has been funded by the National Science Foundation, the American Council of Learned Societies, the U.S. Air Force Office of Scientific Research, the U.S. Office of Naval Research, the National Institute on Aging, the Society for Human Resource Management and various business organizations. Stephen Zaccaro, Ph.D., is a professor of psychology at George Mason University, Fairfax, Virginia. He is also an experienced leadership development consultant. He has written over 120 journal articles, book chapters, and technical reports on group dynamics, team performance, leadership, and work attitudes. He has authored a book titled, The Nature of Executive Leadership: A Conceptual and Empirical Analysis of Success (2001) and co-edited four other books, Occupational Stress and Organizational Effectiveness (1987), The Nature of Organizational Leadership: Understanding the Performance Imperatives Confronting Today’s Leaders (2001), Leader Development for Transforming Organizations (2004), and Multiteam systems: An Organization Form for Dynamic and Complex Environments (in press). He has also co-edited special issues of Leadership Quarterly (1991-1992) on individual differences and leadership, and a special issue for Group and Organization Management (2002) on the interface between leadership and team dynamics. He has served as Principal Investigator or Co-Principal Investigator on multiple research projects funded by the U.S. Army, and other military service branches. These projects were in the areas of multiteam systems, team performance, shared mental models, leader-team interfaces, leadership training and development, leader adaptability, executive leadership and executive coaching. He serves on the editorial board of The Leadership Quarterly, and he is an associate editor for Journal of Business and Psychology and Military Psychology. He is a Fellow of the Association for Psychological Science, and of the American Psychological Association, Divisions 14 (Society for Industrial and Organizational Psychology) and 19 (Military Psychology).